Concrete leaf casting is a fun and inexpensive way to add a birdbath to your landscape. If you live in a cold climate, one of the benefits is the ability to grow Rhubarb plants. A decorative rhubarb-leaf birdbath can add beauty to your garden year-round. Finish your birdbath with colorful paint to create a leaf that looks whimsical or life-like. Rhubarb-leaf birdbaths make wonderful, personalized gifts that almost anyone would love to receive. Choose a comfortable place to set up your work station. A garage or workshop is ideal, however a plastic-covered picnic table will work as well. Place a flat piece of cardboard on your table. Slice off a fresh rhubarb leaf with a sharp knife. Pour your play sand into a pyramid-shaped pile on top of the cardboard. Make the sandpile a few inches bigger around than your Rhubarb leaf. Place your Rhubarb leaf on top of the sand with the under-side up. Arrange the sand under the leaf to form a deep basin for your birdbath as well as support for the leaf edges. Use a cotton ball to spread a light layer of mineral oil onto your rhubarb leaf to prevent the leaf from adhering to the concrete. Put on gloves and a dust mask. Use a fine sand mix rather than an aggregate for best results. Mix your concrete according to the package directions in a five gallon bucket or pail. Scoop out a handful of wet concrete and squeeze. If it crumbles, it is too thick and you need to mix in a few more drops of water. Avoid using soupy concrete mixtures. Scoop some concrete out of your bucket. Place it in the middle of your rhubarb leaf. Carefully pat it down; avoid moving your rhubarb leaf out of position as you spread. Continue scooping and spreading concrete until the center portion of your Rhubarb leaf is covered completely with a 2-inch layer of concrete. Use your trowel to taper the wet concrete down to a thickness of 1/3 inch along the edges. Press firmly down to release air bubbles. Use your heavy-duty wire cutters, cut a piece of steel chicken wire slightly smaller than your Rhubarb leaf to use as reinforcement. Bend and place chicken wire so it spans across the entire leaf, but does not poke out over the edge. Scoop more concrete and place on top of the wire reinforcement. Use your trowel to spread it around. Aim for a thickness of 4 inches in the center; taper concrete gradually down to a thickness of 1 inch on the edges. Flatten the middle area so your Rhubarb birdbath will sit squarely on a pedestal or on the ground. Pay special attention to touching up the edges of your Rhubarb leaf; use your trowel to create a wavy pattern instead of smoothing the leaf edges out to a flat and even thickness. Once satisfied with the shape and outline of your concrete rhubarb leaf, cover with a piece of plastic wrap. Allow your Rhubarb birdbath to dry for 48 hours. To avoid cracks in the concrete, spray the concrete lightly with water approximately once every eight hours. Get some help to carefully turn over your concrete Rhubarb leaf. Use extreme caution when handling your new birdbath. Do not pick up by the edges or bump the edges. Peel the leaf from the concrete. 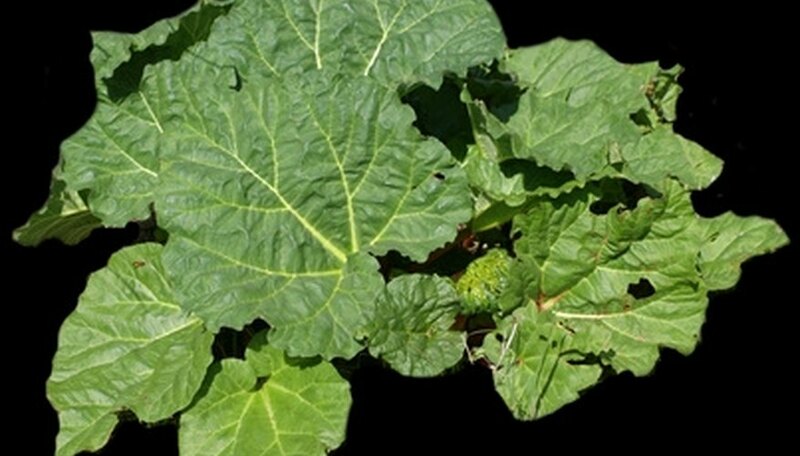 Use a flat-head screwdriver to trace the rhubarb leaf veins. Use a fine-grit sandpaper to remove leaf residue or touch up any imperfections. Gently spray your concrete birdbath with a garden hose to remove all residue; drain off excess water. Keep birdbath covered and shaded to finish curing. Lightly mist with your garden hose every few days; allow to cure for 20 days before using or finishing. Paint with latex paint if desired after concrete is cured. Seal with concrete sealer and move your rhubarb-leaf birdbath to its place in your garden. Place on a pedestal or directly on the ground and fill with water. Claire Joy began writing professionally in 1999. She has written scripts and advertising for building and home improvements, and she has penned hundreds of letters to Congress for a grassroots outreach effort. Her work also appears on eHow. Joy helps with a family contracting business, and she holds an associate degree in marketing and management from Kennebec Valley Technical College.